Ever wonder what the stories behind the paintings in the museums might be? Other than what we know through art history, that is... something about the subject of the painting, about the circumstances that led to the particular painting, about the painter's inspiration for it... especially for those rather obscure paintings of which we know little, except the artist and the period. Particularly folk art. Ammi Pillips, an itinerant painter born in the late 18th century, painted a series of portraits of little girls in red dress. The discovery of this fact in itself was quite a revelation as noted in this piece. Apparently, the artist was quite prolific, but finding and attributing his works proved quite a challenge. Inspired by one of Ammi Phillips' paintings in the Museum of Folk Art in New York City, the author has presented an imaginative tale behind the portrait. 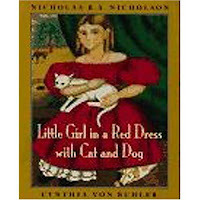 "That's me over the fireplace", starts the book, showing a portrait of a little girl in a red dress, holding a cat, with a dog by her feet. Imagine being the youngest in the family, a largish family, where everybody has their role carved out and are busy attending to the many chores, leaving very little time for indulging the youngest. You are too noisy, says her dad and sends her away to do something else so he can get his task done in peace. You'll just be in the way when I serve tea, run along now, says her mother. You'll cut yourself, it is too dangerous, so go help you sisters, say her brothers who are chopping wood. You'll only mess up our needlework say her sisters asking her to help the cook in the kitchen. Of course, the cook, Mrs.Tucker is too busy getting things ready that she doesn't even notice the little girl. So mostly, I ran around with Cat and Dog, she tells us. Naturally, she gets bored when left to her own devices. Let's face it, all children want more time with their parents, no matter how much time we parents manage to spend with them. And children most certainly want to be included in the activities, not shooed away to amuse themselves somehow. The book explores this topic artfully through the little girl's eyes while showing the typical life of a landed family in 1830s New England. Now imagine the excitement when a stranger decides to focus all attention on her by having her sit for a portrait, to which she happily agrees. Suddenly she finds herself treated like a princess, with her family proud and beaming. The description of the activities in the house with the arrival of Mr.Phillips puts us right in the thick of it. We feel the bustling household making room for the stranger - accommodating and hospitable - yet focusing on the tasks at hand, letting nothing come to a standstill. The kind of relationship Ammi Phillips must have had with his young sitters, traveling as he did, painting to make a living while exercising his artistic muscles, is explored quite interestingly in this book. When the little girl tells Mr.Phillips how much she would miss him, we know that she was not just another still-life subject, distant and inanimate, that he waved good-bye to as he left. The paintings by Cynthia von Buhler are amazing, very reminiscent of folk art. Each page shows beautiful scenes not just of the people, but, of the clothes and countryside, of the house and farm. It felt like a trip to the museum, just looking at each page in this book. The minute details captured in each painting doesn't let us turn the pages in a hurry. A delightfully charming touch is the portraits on the inside back-flap, of the author and the illustrator, that leaves us smiling. The clothes of the period naturally intrigued my daughter and we tried to read about what they wore in that period and whether we would find it comfortable today. 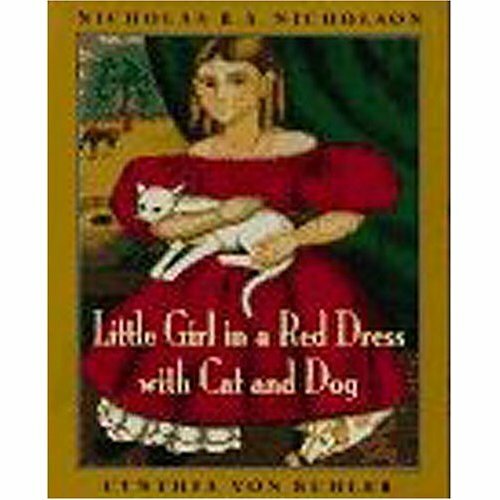 She was smitten with the bright red dress and wanted one for herself, which as we found out, happens to be the favorite dress of the little girl's sister. Why was there so much excitement about painting the little girl? Why was there no camera to take pictures and see it in the computer like we do? And, when I explained about how not everybody had cameras in their homes back then, and how paintings were a great way to have artwork of the person created with special care, this fact became the most intriguing part of the book for my daughter. That, and the fact that the little girl had so many brothers and sisters who wouldn't play with her. Not to mention, the interest in finding a red dress for herself and getting herself painted, possibly by me. All in all, a refreshing book that opened up a few doors of exploration for us. Loved your review. Isn't it wonderful that there are so many possibilities with a book? And that children always, but always, are willing to look at the printed word as the truth? Difficult sometimes, too. wow. What an interesting idea. Story behind the paintings for kids. This would be a great way to introduce kids to paintings. Thank you sheela for another wonderful find and review. Lovely review Sheela, its always a pleasure to read your description of the book. Liked the way you have put - kids do not like to be shooed away but want to be part of the activities. "Ever wonder what the stories behind the paintings in the museums might be?" I do. I try to find the facts behind it. It started with Monalisa and the mystery behind it. But I have found with my children, they make up their pwn story :) It is very interesting. Thanks for the review Sheela.